The "Electric Universe" is a hypothesis, a new way of interpreting scientific data in the light of new knowledge about plasma and electricity. In this interpretation, gravity plays a secondary role behind the far more powerful electric force, and electrified plasma in the laboratory provides a model for comprehending newly-discovered phenomena in space. As laboratory plasma "pinches" into filaments, sheets, and cells, or isolates charged bodies from their electrical environment, it provides vital clues. In plasma, electric currents will sort material into shells of like elements, or generate discharge configurations--ranging from radial streamers and spiraling filaments to exotic symmetrical configurations--all appearing to mimic what we now see in faraway corners of the cosmos. 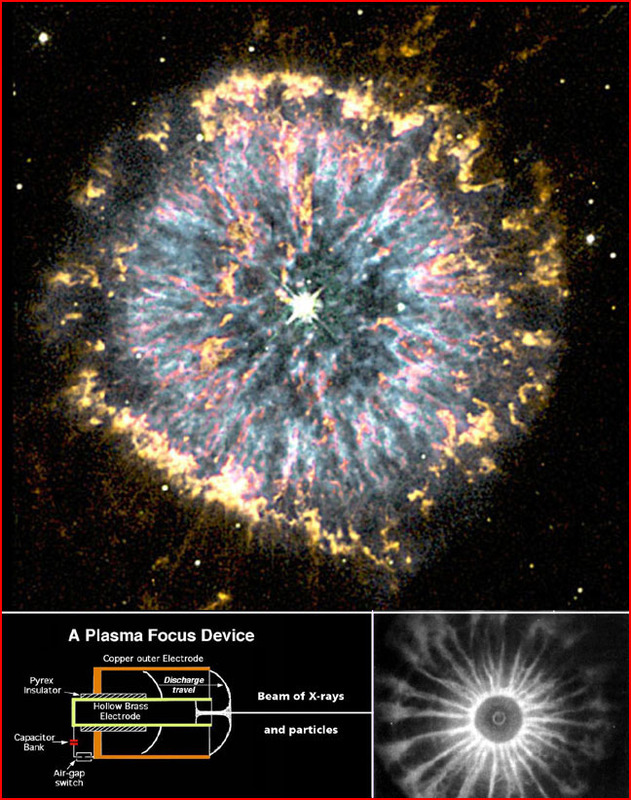 The top image above is a Hubble Telescope image of the planetary nebula NGC 6751. The experimental counterpart is provided by a plasma focus device (below left), which concentrates electrical energy in an explosive discharge (below right), mimicking the structure of NGC 6751. In the electric universe the systems of planets and moons, stars, and galaxies have their origin in this proven ability of electricity to generate structure and rotation in plasma. Within particular regions of aggregating mass, gravity can take over only as the electric forces approach equilibrium. The electric universe hypothesis is rooted in direct observation. The extraordinary configurations now seen in space are the result of charge differential, where gravity cannot compete with the electric forces. Such structures as NGC 6751 are telling us it is no longer tenable to build a cosmology on the idea that neutral matter is the "starting point". All variations on that theme will require gravitationally-driven generators to "separate charge". But it is not logical to ask the weak force of gravity to produce the strong force of electricity from which galactic-scale gravity defying motions arise. Direct observation implies that electrified--not neutral--matter, is the fundamental or original state of the universe. To be sure, the human perspective is limited, and the origin of the universal electric potential will likely remain as elusive to the cosmic electricians as the origin of matter is to orthodox cosmologists. In both cases, for now at least, the theorists must be satisfied with the proclamation, "It just is! ".